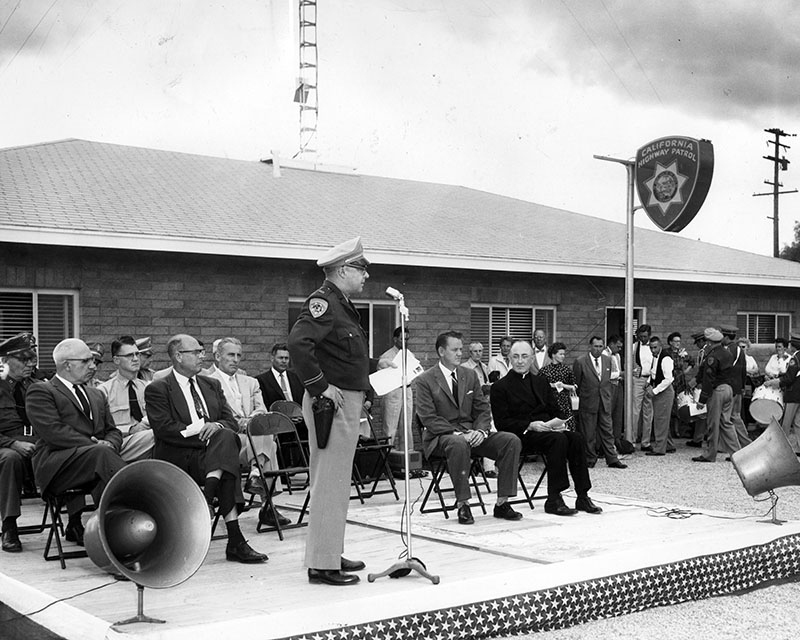 SCVHistory.com | Law Enforcement | Newhall CHP Office Opens, 5-8-1957. May 8, 1957 — "Capt. E. A. Smith, personnel director of new California Highway Patrol office in Newhall, extends greeting to dignitaries during dedication ceremonies. Community leaders took part in official opening of office at 25022 N. Golden State Highway, Newhall" (Valley Times, 5/9/1957). The California Highway Patrol, initially a branch of the DMV, was established in 1929. A patrol area for Soledad Township was established December 1, 1938. Patrolmen covered the Santa Clarita and Antelope valleys from leased space in the Newhall Sheriff's substation at 6th Street and Spruce (now called Main Street). On July 15, 1941, they moved into their own office at 15th Street and San Fernando Road (now called Railroad Avenue). In 1955 the Antelope Valley was split off and a substation was established in Lancaster. On May 8, 1957, a new, larger office for the Newhall CHP opened on the west side of Highway 99, just south of Lyons Avenue (address 25022 N. Golden State Highway). Ten years later, on December 20, 1967, the Newhall CHP moved to the east side of the highway (25111 Golden State Highway; grand opening February 21, 1968), on a 10-year ground lease from a private party. In 1991 the CHP built a new, $4.7 million, 15,000-square-foot office six miles to the north on a 1.7-acre site that it lease-purchased (28648 The Old Road). It opened September 15, 1991. The Newhall Signal and Saugus Enterprise | Thursday, May 16, 1957. The clouds managed to hold off threatened sprinkles during the dedication of the new California Highway Patrol building on Highway 99 last Wednesday afternoon, thus keeping the unpaved entrances accessible to the 100-or-so persons assembled for the open house. Deputy Commissioner Ross McDonald, from Sacramento, gave a brief but interesting history of the progress of the CHP in his dedicatory address. December 1, 1938 marked the establishing of a patrol area in Soledad Township, under the command of Captain L.B. Kennedy, with a complement of 10 officers and one clerk, one officer being assigned to the Antelope Valley district. The facility of a room in the Sheriff's office was used until the completion of a CHP building on north San Fernando Road, on July 15, 1941. The personnel was increased to 35. Two years ago, a sub-station was established in the Antelope Valley at Lancaster to handle the increased traffic movements caused by the development of the aircraft industry in the valley. With the increase of vehicular traffic in this area, it became necessary to establish a new patrol office on U.S. 99. These two offices now have a personnel of 57. The building is 2,200 square feet, and has eight rooms, with plenty of parking space, including a back parking lot for eight patrol cars. Negotiations for paving the front is underway in Sacramento. According to Commissioner McDonald, this makes 14 buildings of this type built in California within the last three years. Three bombs, three large bangs, and three little flags dropping down from the sky preceded the raising of the colors. Art Thompson sang the national anthem, accompanied by the Hart High School band, under direction of Robert Warriner. Invocation was given by Father Henry Banks. "Cruisin' in My Model T Ford" was sung by the Barbershoppers. The song was especially appropriate, and very well sung. Captain Edwin A. Smith gave the welcoming address. Among the visitors were Russell E. Fuson. supervising inspector, southern zone, Los Angeles; Pat Lizza, Win. D. Parks, Frank Briggs, J.C. McGinnis, Ed Carroll, Security Officer at Edwards; R.A. Kridder; Inspector A.F. Dillon, Sacramento; Lockheed Plant Protection Chief Paul Scott; Lt. Bruce Gourley, Captain Wm. Fudge, LAPD, Van Nuys; Al Warnburg, D.A. Office, Los Angeles; Lt. Dan Velasco, San Fernando P.D. ; Judge MacDougall; Saugus Postmaster Leon Scammon, Cec Knaggs. Prominently displaying their fiesta badges were Monte Odett, Walter and Allan Rueff, Mike Shannon, Al Lyons, and Warren Swenn, of San Fernando. Sally Perry, Vera Jefferson, Pat Maxon and Betty Servoss of the Station Staff were the gracious hostesses. 9600 dpi jpeg from smaller jpeg. Online only.